The cuts proposed in Gov. Mike Dunleavy’s budget would have big impacts for housing and homeless service programs. In Juneau, providers say the loss of funding could put some of Alaska’s most vulnerable residents back on the streets. According to city data, Juneau has about 200 homeless residents. Over the last three years, the number of chronic homeless individuals has grown. But not all of them are living on the street. A big reason for that is Housing First, a supportive housing complex that opened more than a year ago. 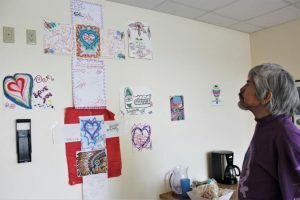 Matthew Fred Jr. — who goes by J.R. — struggled with substance abuse, health problems and homelessness for years before moving into Housing First. “It’s going on almost three months now since I became intoxicated. And it’s with the help of the staff here,” Fred said. Fred said three Housing First staff members sat down with him after that and helped him develop goals. “I hate to say it, it sounds like a pun, but it was a sobering meeting with them. But it helped!” he said. That’s the whole philosophy behind Housing First — give people a roof over their heads, the tools to improve their lives, and the agency and the time to do the rest of the work themselves. Each of the 32 residents has their own room with a bathroom and small kitchenette. The facility also has an on-site medical clinic. Since moving in, Fred has been able to receive counseling and have cataract surgery. Soon he’ll have a dental appointment to replace several missing teeth. He plans to enter a job training program soon too. Davis said residents have spent an average of nine years homeless. Some spent close to 20 years on the streets and bouncing between various shelters before moving in. Researchers from the University of Alaska have been tracking residents. Their research shows that residents’ calls for emergency services and interactions with law enforcement drop considerably once they move in. But according to Davis and other service providers in Juneau, the governor’s proposed budget would cut $11 million in funding to state programs that are key resources for housing support and other services. Mariya Lovishchuk is coordinator of the Juneau Housing First Collaborative. She said if the proposed budget passes, the effects would be drastic. The Housing First Collaborative has also been working on Phase Two, which would add another wing to the complex to double the amount of supportive housing. Lovishchuk also runs the Glory Hall downtown. They have a staff of nine, about 40 beds and serve meals year-round. She said the cuts would force them to choose between cutting back on meals and closing for part of the year. The budget uncertainty has left Fred and other Housing First residents and staff anxious. Gov. Dunleavy has been touring the state this week holding meetings with Alaskans to promote his budget. His Press Secretary Matt Shuckerow said the proposed cuts are crucial to turning Alaska’s economy around and ensuring growth in the future. The Legislature is still working on its version of the budget. So far, the proposed reductions have been much smaller than the governor’s.